Corsets, child labor and a mortal fear of masturbation: a wonderfully detailed romp through the “day-to-day reality of life” for Victorian men and women. Having spent a year on a “Victorian” farm, among other antiquated kinds, and written about it (co-author: Victorian Farm: Rediscovering Forgotten Skills, 2008, etc. 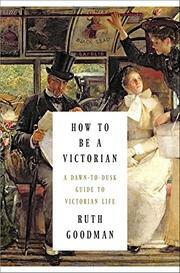 ), English social historian Goodman proves an amiable companion in sharing the intimate daily routine of the Victorian, including all social classes and ranging over more than 60 years, from Queen Victoria’s early reign to her twilight. Goodman begins the day with the knocker-upper, wandering the streets at all hours with a long cane and lantern to knock on windows and wake up his working-class clients for their factory jobs (since few then could afford clocks and watches). The author then continues through the chilly morning ablutions at the washstand, elaborate dressing rituals, long workday, bland meals and, finally, “a few snatched hours of leisure.” The author dispels many myths about these buttoned-up souls (that they were unclean, prudish or unfun) and shows how many notions of personal hygiene, kitchen science and sexuality were revolutionized during this era—e.g., the insistence on extensive circulation of air in rooms, the preference for breathable fabrics like wool and cotton, the adoption of baths and public bathing, the switch from privy to water closet and the use of contraceptives. Goodman claims to have made condoms from sheep’s guts, which were used before the vulcanization of rubber in 1843. In 1862, officials set standards for schools, including written examinations, imparting a national focus on formal education (even for girls). Throughout, Goodman relates her own experiences immersed in the Victorian world, such as her surprisingly pleasant time wearing a corset. A lively, expert resource for historical minutiae.